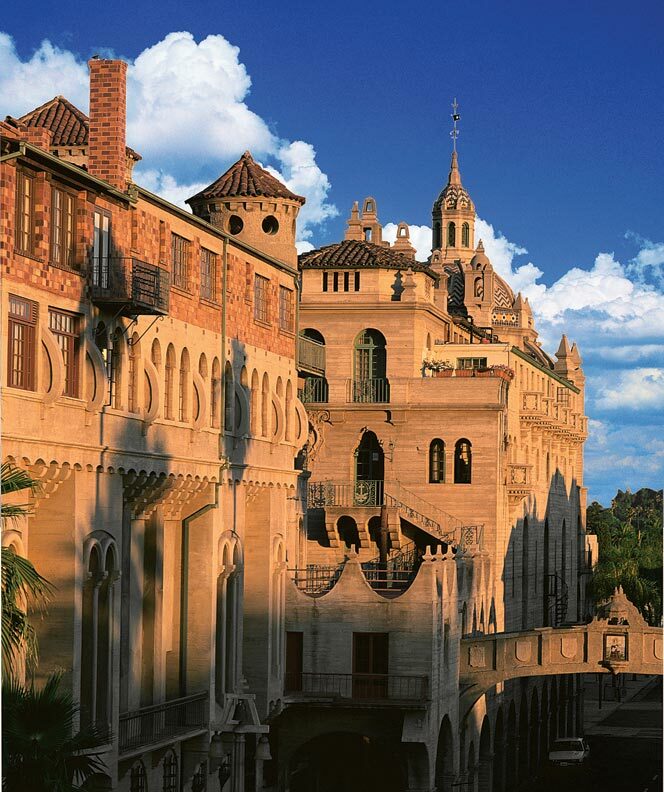 In Riverside, the Historic Mission Inn Hotel & Spa started as an adobe guesthouse in 1876. Spanish Colonial houses have an attractive simplicity of form. Because the revival embraced multiple references, interpretation was flexible. 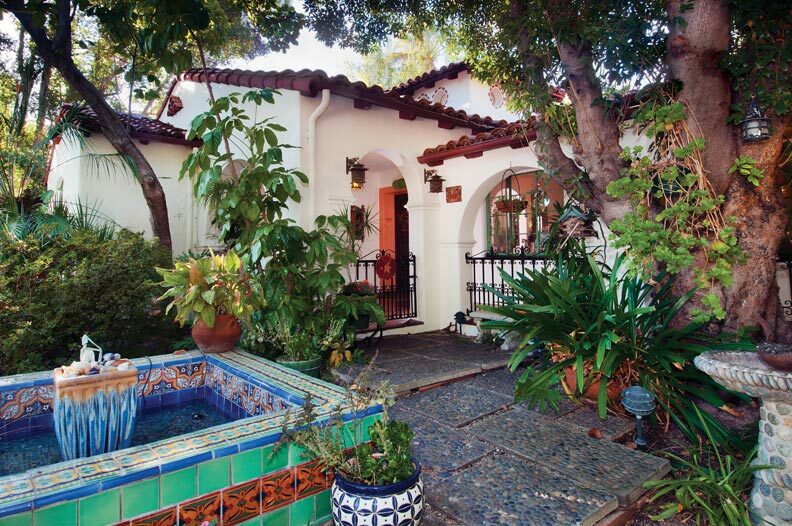 A handful of characteristics define the look: low-pitched red tile roofs, white stucco walls with rounded corners, tile ornamentation, wrought-iron grillework. Courtyard gardens, bougainvillea-covered patios, and arched breezeways take full advantage of California’s temperate climate. Alta California’s relatively brief Spanish Colonial period stretched from 1769 to 1821. In a state that already revered the old missions, real-estate boosters capitalized on the romantic past in the early 20th century. The inauguration came with San Diego’s 1915 Panama–California Exposition, when New York architects Bertram Goodhue and Carleton Winslow created a unique Expo campus that referenced Spanish Churrigueresque (or Baroque), Mission Revival, Mexican, and even Islamic and Persian styles. 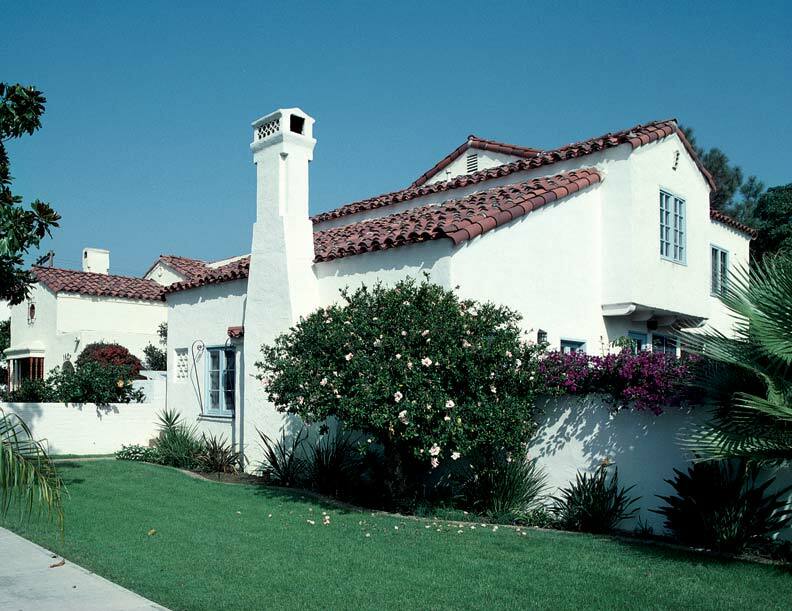 Delighted critics dubbed the innovative style “Spanish Colonial Revival,” and it became widely embraced as the California vernacular. The height of the Spanish craze was between 1920 and 1930, when the population of Los Angeles doubled (to 1.2 million) and housing demand skyrocketed. As Hollywood’s motion-picture industry flourished, hillside developments like Whitley Heights provided a level of exclusivity and privacy. Rudolph Valentino, Jean Harlow, and W.C. Fields flocked to the chic enclave and made this arguably the first L.A. celebrity community. Nearby Hollywoodland, directly below the now-famous Hollywood sign, was another planned community with impressive revival residences that attracted actors. Fine woodwork, tile, and ironwork are on display at La Casa Nueva. Spanish Colonial is ubiquitous in the metropolis and surrounding areas. On L.A.’s west side, Westwood and neighborhoods within the bustling Miracle Mile district boast many blocks of modest, well-designed and -maintained Spanish homes. The wooded canyons of the Verdugo Mountains serve as a backdrop to the magnificent Rossmoyne Historic District in Glendale, where gorgeous, relatively large homes line peaceful, curvilinear streets. Several truly grand, architect-designed Spanish homes can be found in Beverly Hills, Los Feliz, and San Marino. 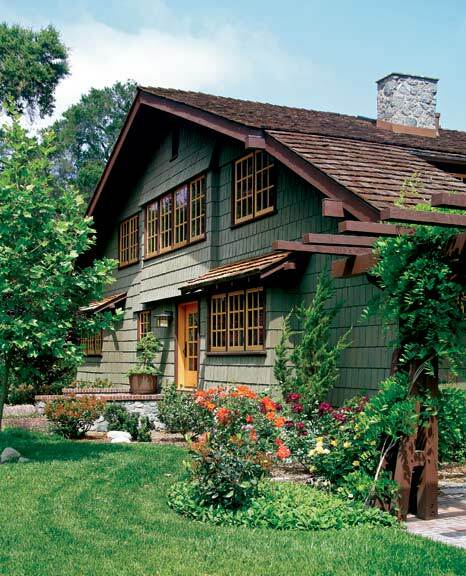 Master architects Reginald Johnson, Myron Hunt, Elmer Grey, and Wallace Neff all had ties to the Pasadena area; visitors can admire their legacy in neighborhoods surrounding CalTech and the Huntington Library. La Casa Nueva (1922–27) is on the grounds of the Workman and Temple Family Homestead Museum in City of Industry. 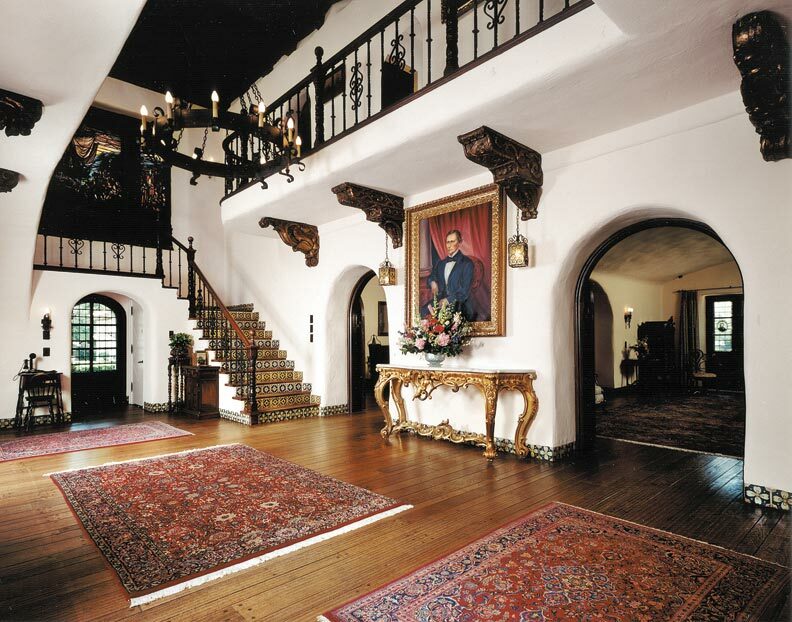 The high-style Spanish Colonial Revival mansion is noted for its fine stained glass, ceramic tile, wrought iron, and carved wood. After a remodel, the house reopened in 2011. Historic Adamson House (1929) is a National Historic Site, California Historical Landmark, and a California State Park in Malibu. It was designed by architect Stiles Clements for Rhoda Rindge Adamson and her husband, Merritt Huntley Adamson. The house is a stunning showcase for local Malibu Potteries tiles—the business venture of Rhoda’s mother, May, who used locally found buff and red clay to produce authentic versions of Mayan, Moorish, Moroccan, Saracen, and Persian designs. The pristine Spanish Colonial home also retains excellent period furnishings and lovely grounds oriented to the picture-perfect seascape. Whitley Heights Historic District is five miles northwest of downtown L.A., just north of Franklin Avenue in Hollywood. Follow Whitley Terrace and Milner Roads through the neighborhood. Rossmoyne Historic District is in Glendale, eight miles north of downtown L.A. The corner of Rossmoyne Avenue and Mountain Street (near Nibley Park) is a good starting point. Mid-Wilshire District is six miles west of downtown L.A., in the streets surrounding San Vicente, Wilshire, Olympic, Pico, and La Cienega Boulevards. Look for the PicFair Village, South Carthay, and Carthay Circle neighborhoods. 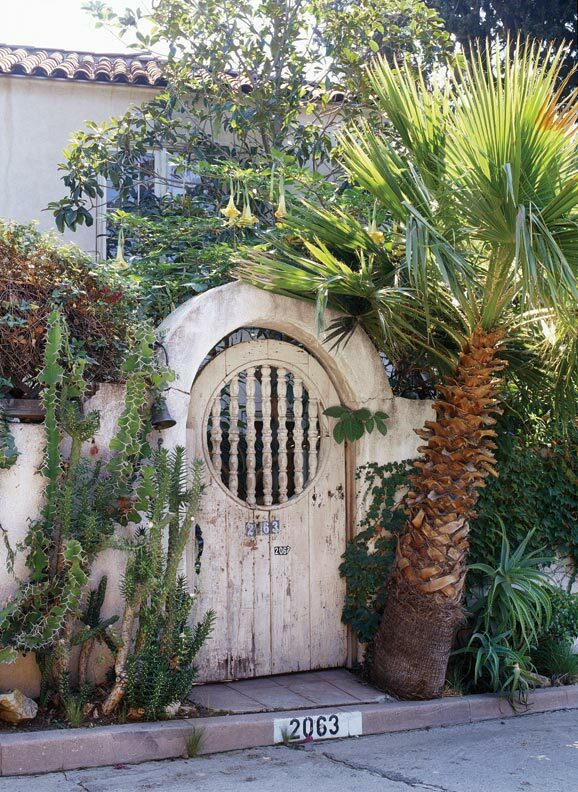 Pasadena is a destination itself, 10 miles northeast of downtown L.A. Once you’ve seen the Gamble House and Bungalow Heaven, head to the city’s southeast side near the California Institute of Technology and Huntington Gardens to see Spanish Colonial Revival neighborhoods. Visit San Pasqual Street, Lombardy Road, Orlando Road, and California Boulevard. Hotel Bel Air opened in 1946, during Hollywood’s Golden Age. Its tucked-away location in a canyon above Sunset Boulevard offered an exclusive, luxurious retreat frequented by film stars. The pink stucco façade, red tile roof, archways, wrought-iron terraces, fountains, private tiled patios, and lush tropical gardens create a Spanish oasis theme.